It is tough enough to stand out from the crowd when you sell something tangible – a product. But it is exponentially harder to distinguish your business from its competitors when what you sell is intangible – a service, or advice. That’s the challenge facing professional services firms, such as management consultants, law firms, accounting firms, architects, design firms, leadership development firms, executive recruiters, etc. 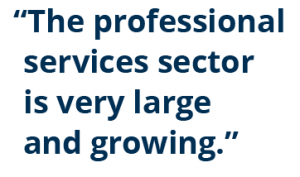 Professional Services are Big Business in the U.S.
As the market grows and competitors proliferate, professional services firms face the commoditization of services and downward pressure on fees. The best defense against this is a strong brand that signals why your firm is unique in a meaningful and credible way that your clients, prospects and staff will value. Then, and only then, can you command a fee premium. 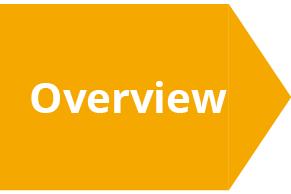 Yet many professional services firms come across as complex, fragmented and undifferentiated. This is the result of a variety of factors; mergers, acquisitions, rapid proliferation of new service offerings, and name changes. Consequently it is often difficult for a prospective client or job candidates to tell what a firm actually does, let alone why they should choose it over its competitors. 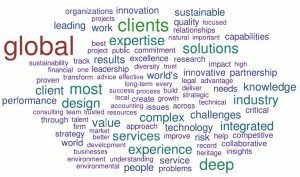 The words and claims professional service firms use today do not accurately describe the differences and individual firm strengths. Instead, they blur into homogeneity. 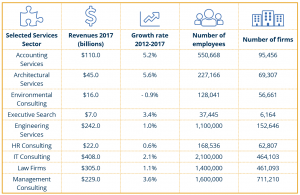 Note: Based on the self-descriptions and claimed differentiators from the websites of the top ten firms in each of the eight key professional services sectors listed in the above table. These firms are failing to meet the challenge of differentiation, opting to blend in rather than stand out. In doing so they are putting themselves at risk of competing solely on price. There is a better way. 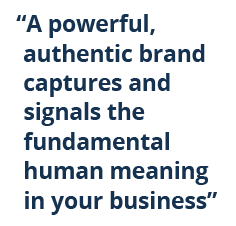 A powerful, authentic brand captures and signals the fundamental human meaning in your business – the thing that sets you apart and makes you matter to your marketplace of potential clients and potential recruits. It is therefore a strategic business issue, way upstream from the issues usually associated with brand (e.g., name, logo, visual style). Those are symbolic expressions of the brand, shortcuts to the meaning in the business: they are not the brand itself. Shorten the sales cycle and generate quality revenue by enabling the right clients to self-select. By signaling clearly your beliefs, values and unique point of view, the brand enables like-minded clients to see you and select you. Shorten the recruiting cycle and attract quality talent by enabling the right recruits to self-select. Likeminded recruits will share your passion and bring new levels of creativity to the mix, making your organization extraordinary. Define and protect a unique arena for your firm by establishing a platform that enables you to stand out and be known for something important. Unite and align your firm’s practice areas and geographies by creating a galvanizing brand idea that enables them to act as one and benefit from the brand’s equity. The effort involved in building a strong brand aligns and focuses the business, and can bring significant rewards inside the firm as well as the marketplace. Professional services brands face a set of distinctive challenges. In the manufacturing and consumer goods arena, the product conveys the brand and you can paint meaning onto the product via advertising and communications. But in professional services firms it is the professionals themselves who convey the brand in their relationships with their clients. They represent the brand in every interaction. Those professionals cherish their individual autonomy and will not usually be happy to march in lockstep or parrot a corporate script. Yet the firm needs its clients to have a committed relationship to the organization, not just to the individual consultant. Brand offers a way to square this circle by building a shared sense of the meaning in the business, while at the same time enabling individuals to express that meaning in a way that is authentic to them. Relationship is the envelope that wraps the client work. Thus from a branding perspective, professional service firms need to understand and leverage the emotional value of the relationship as a key differentiator. Attracting and developing talent is as important as attracting and developing clients. Therefore, creating alignment between the internal and external brand is an imperative. Brands are ultimately about meaning. Stories are the building blocks of meaning. And stories that connect your brand with a fundamental human need can help you build a powerful connection with your clients. That is as true for consultants, accountants, lawyers and architects as it is for car makers, computer manufacturers and food brands. The difference is that while we have long accepted that emotional connection can drive consumer purchases, we like to think that business-to-business purchases are driven entirely by cold reason. They are not. Take the case of the world’s top two strategy consulting firms, McKinsey & Company and The Boston Consulting Group (BCG). They both hire the top graduates from the same small pool of elite business schools; they both offer a similar range of services to solve a similar range of client problems; they both sell to C-level executives in large, complex businesses; and they both have excellent reputations. On the face of it, the two firms seem so similar that it ought to be hard for a prospective client to choose between them. But the brand story that each firm tells is quite different. At the heart of the McKinsey story is the promise of power and control – the stability and order that enables prosperity. BCG on the other hand, tells a story that promises understanding and transformation – the insight that empowers you to change your circumstances for the better. Both are compelling stories, but they each appeal to a different client mindset. So how do you discover and then develop your authentic brand story? There are strong clues in the recurring iconic stories about the firm that your professionals tell themselves. The stories that clients tell about you (and the language they use to tell them) are also powerful sources. In both cases, it takes skilled questioning and astute listening to draw out the truth in the tale. Once you have discovered the fundamental brand story that fits your organization, it then has to be developed into compelling market-facing messages, woven through all your communications and, crucially, embedded in the culture of the firm and the behavior of your people. Discover. This is a foundational phase that defines the core building blocks of the brand, the key attributes, and importantly, the “brand story”. This is a critical step as finding the right brand story helps everyone in the firm live the brand. 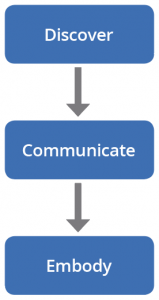 Communicate. 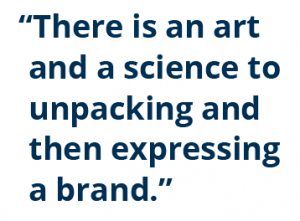 There is an art and a science to unpacking and then expressing a brand. In this stage of work, the focus is on defining key messages, identifying the key issues that your brand needs to “own” and focusing your intellectual capital development to support those issues. The brand story and external messages are then expressed in a suite of external marketing tools and woven through everything from your client credentials deck to your website. Embody. Your brand is a mandate, not a mask. 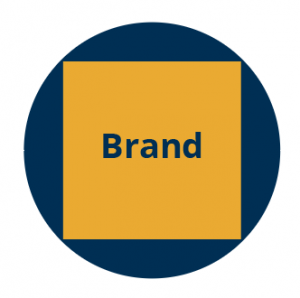 Beyond words and symbols, a professional services firm needs to learn to live the brand. In this phase, the focus is on aligning the internal and recruiting brand with the external brand, and embedding the brand into the three core business processes (developing clients; developing talent; developing ideas). Professional services brands are not like consumer brands, and the process of developing them is different. Programs that work in traditional businesses often fail. But with the right approach, one that accounts for the realities of the professional services “ecosystem”, it is possible to develop a powerful brand proposition that appeals to both head and heart, one that differentiates the firm and generates greater demand.